Profile: Creating confusion is Astrotrain's specialty. As a Decepticon Triple Changer he can switch from robot to locomotive train to space shuttle almost instantaneously. This ability not only leaves unsuspecting enemies perplexed, but often vulnerable to his attack. His favorite ploy is to lure an Autobot to chase him as he enters a railroad tunnel in train mode and then exits in shuttle mode. The Autobot is usually ill-prepared to battle the shuttle-mode Astrotrain and rarely knows whether two Decepticons or one confront him. But it is that particular moment when his opponent realizes his mistake that especially delights Astrotrain. He truly lives for that moment and thrives on his foe's panic and fear. "It makes it all worthwhile," Astrotrain says gleefully. "That part I enjoy even better than destroying him afterwards!" 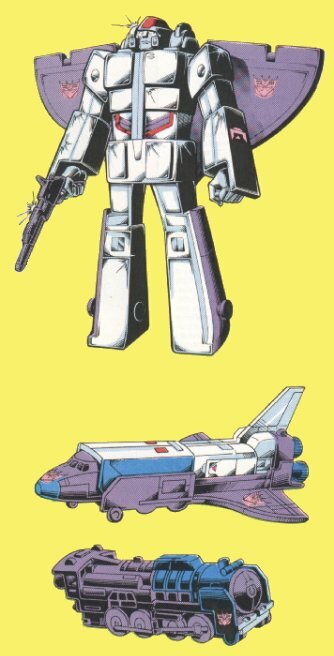 Abilities: As a space shuttle, Astrotrain can achieve, under his own power, planetary orbit, where he can attain a maximum speed of 20,000 mph. He can launch weapons and satellites while in orbit, and carry other cargo as well. If he carries an extra fuel supply, he can leave his orbit and is capable of true space travel, boosting his speed to 50,000 mph. He would be able to travel from the Earth to the Moon and back, but not much more. As a train, his top speed on rail is 400 mph and he has a range of 1700 miles. In robot mode he has great strength and carries a powerful ionic displacer rifle, which destroys by disrupting molecular bonds in metal alloys with its beam.